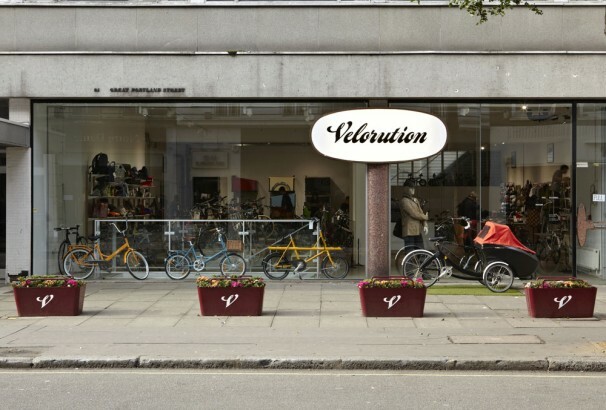 Velorution is a specialist cycle store in central London who after more then five years moved to new, larger premises. Growing from a “boutique” to a store that caters a wider market, accommodating families, children, commuters and beginning cyclists, who are after quality and smart products. Simultaneously it improves vastly through a new large and bright workshop space. Velorution builds on being a hub for retail, recognized for value for money, to also become a place for discussion and presentation of issues related to cycling in the city. To accommodate this we set out concentrating on the pleasure of cycling, celebrate the innovative and stylish products and make a space for conversation. The interior concept translates the brand identity of Velorution as set out in their web presence to their physical retail space. While creating an interior that is easily adaptable to different needs; product display, video presentations, cycle fashion shows, product launches. The display furniture has been designed to be multifunctional. This ambition has been realized through an interior design composed of mobile units. For example the bicycle presentation platforms, which can be moved around to create different arrangements for a variety of uses; for use of bicycle display, they can be arranged like an arena for seating during video screenings and presentations, or these can be assembled as a catwalk for fashion shows. A new shelving system has been developed in order to make easy changes of display for new products, special features, a general refresh of display or adapting to stock changes. This system creates an organized rhythm in the space. Throughout the store there has been a consistent use of white surfaces to display products. White as a neutral background makes the smart products really come to the fore. These surfaces have been used in combination with Oak making a warm and friendly combination of clean bright surfaces with natural elements. The minimal design of the elements creates a transparent design that is understood in a glance and makes a clear display.